For college students, staying up late is a part of the package. 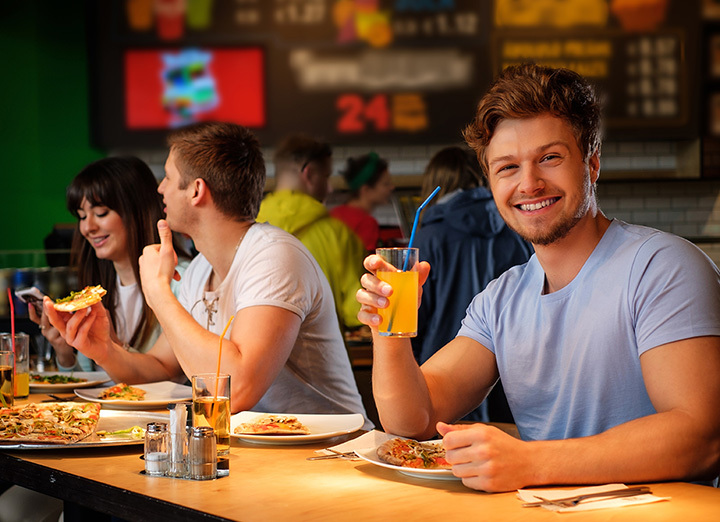 Whether you’ve spent the night out with friends at the bar or you’re simply cramming for a test, it’s vital that a food spot be open late to fuel you! These University of Michigan eateries have you covered. Check them out. The Fleetwood Diner in Ann Arbor is quite possibly the king of late-night food by virtue of being open 24 hours. There's literally not a time of day where it's closed, so no matter how late your night gets, Fleetwood Diner will be able to cover you. Better yet, you'll have a wide range of options, too, starting with an omelet for an early breakfast to a club sandwich for a really early lunch to a steak for a dinner so early it might just be late instead. Throw in vegetarian options and Greek dishes and you've got just about anything just about any time. The simple hamburger, a combination of meat, bread, and a cornucopia of further toppings beyond, is a staple of American life, and late-night life is no different. Detroit staple Hunter House Hamburgers recently made its way to Ann Arbor, and is delivering some exciting new value. While the menu is a bit limited—you'll have several varieties of burger, hot dog, chicken sandwich and milkshake to consider. Throw in the fact it's open until three in the morning Friday and Saturday and you'll have the late-night feast you need. Mister Spots made a bit of a trip from Ohio to get to Ann Arbor, and it brought with it a great new addition to the late-night dining scene: cheesesteaks. Add on burgers, wings, and a variety of sides—if cheese fries aren't your thing, why not consider adding chili to those cheese fries?—to round out the whole experience. With online ordering and delivery options, it takes a culinary oddity and makes it even more accessible. With both delivery and takeout options running until four in the morning—the only time you can't get a pizza at Ann Arbor's New York Pizza Depot is between four and 10 a.m., except on Sunday when that goes to 11 a.m.—New York Pizza Depot has your late-night pizza craving well in hand. Featuring, soup, salads and subs, there's more going on here than pizza, but the pizza is a standout. The Z Pizza, for example, combines pizza with ziti pasta to create a carb-laden masterpiece that's perfect for fending off the late-night hungries. Granted, Ann Arbor staple Zingerman's Delicatessen isn't really a late-night option as it closes at 10 p.m., when late night is just barely getting started. But that's OK, because everything you can pick up there will be ready to go when your late-night hunger starts. From breads to cheeses to meats and sandwiches and beyond, you'll be ready the second your munchies kick in. Plan ahead just a little bit and satisfy pretty much every craving you've got with Zingerman's staggering lineup. A burrito is a wonderful thing for taking on hunger, at most any time of day. BTB Burrito in Ann Arbor offers them up big and late to address your hunger needs. Running until 3 a.m. Sunday through Wednesday, and 4 a.m. Thursday through Saturday, most every late-night hunger will be addressed. There's even delivery, but that stops at midnight. Try your burrito in several different flavors and sizes—the giant version uses two tortillas—or throw in quesadillas, nachos or plenty more choices to round out the night. Though the late part is debatable—you'll need to get in by 11 p.m.—there's a wide range of unusual Thai dishes on hand here, ranging from pad prik to drunken fried rice. With four protein options to choose from including tofu and five levels of spice ranging from “none” to “dim mak” (loosely translated as “touch of death”), you'll have an incredibly customizable menu waiting for you. Because sometimes, you just want a hot dog and you want it at unusual hours. That's what's waiting for you at Ann Arbor's Ray's Red Hots, open until two in the morning Friday and Saturday. The hot dogs are notable in and of themselves—if you want ketchup on them, you'll get no guff like you might get from some more purist establishments—but there's more than that here. Burgers, vegetarian options, and locally-sourced dairy milkshakes in 35 different flavors are all waiting for you to pull in and enjoy. Next up on the A2 must hit list, Red Hot Lovers! You'll have to make a bit of a trip to Ann Arbor-adjacent Ypsilanti for this one, but when you do, you'll find waiting for you one of the last 24-hour doughnut shops in the area that isn't a grocery store. Fritters, filled doughnuts in jelly and custard, glazed doughnuts, and plenty more are on hand here, as well as a host of other breeds of pastry. Be sure to come back around Ash Wednesday, because Dom's will also offer up the classic Michigan treat known as paczki, which has a long and storied history here. If you've ever been wide awake at 11 p.m. and the first thing that came to mind was “tapas,” you might need more sleep. Conversely, you might have just been sufficiently prescient to see Aventura coming, a tapas restaurant open until midnight in Ann Arbor. With offerings ranging from quesos—cheeses—to charcuterie and even dessert options, you'll have a little something of everything in here. Seriously, where else are you going to get sheep's milk cheese and Iberian pork sausage at 11 at night?